DELAWARE, Ohio – The Woltemade Center for Economics, Business and Entrepreneurship at Ohio Wesleyan University has selected six sophomores for its 2019 inaugural class of Latham Entrepreneurial Scholars. 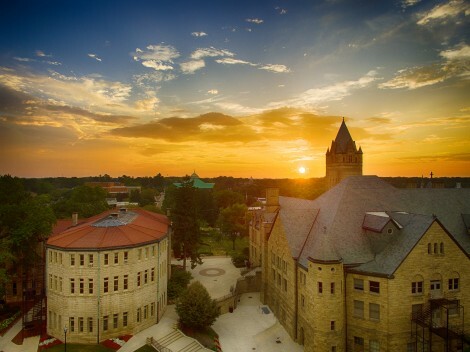 The competitive program supports OWU students seeking to become the next generation of business trailblazers. Sophia Ahmed of Karachi, Pakistan. Ahmed is a Management Economics major and a Women’s and Gender Studies minor. Taryn Barnes of Pickerington, Ohio. Barnes is a Music and Business Administration double major. Katie Bischoff of Marysville, Ohio. Bischoff expects to major in Computer Science with specialization in Data Analytics and to minor in Business Administration. Amber Khan of Karachi, Pakistan. Khan is an Economics and Data Analytics double major and a Politics and Government and Comparative Literature double minor. Austin Plaster of Alexandria, Virginia. Plaster is a Politics and Government and Business Management double major. Jasmine Spitzer of Minot, North Dakota. Spitzer is a Music Education major. Once fully underway, the two-year program will enroll five sophomores and five juniors each academic year from all majors. As sophomores, participating students will participate in a special seminar class covering topics ranging from scientific method/problem-solving to critical thinking/strategic thinking/vision. The scholars also will complete an internship with an entrepreneurial focus and receive a stipend to help support their experience. In addition, they will benefit from access to the new Delaware Entrepreneurial Center at Ohio Wesleyan University, a business accelerator located on the OWU campus and created in collaboration with both Delaware County and the City of Delaware. The Latham Entrepreneurial Scholars Program was created with the support of OWU alumna Carol Latham, Class of 1961. She is the retired founder, president, and CEO of Thermagon, Inc., a custom manufacturer of high performance heat-transfer materials for electronic components. Under her leadership, Thermagon grew to sales of $18 million annually worldwide. The Entrepreneurial Scholars Program is open to sophomores and juniors who have achieved a GPA of 2.0 or higher. Candidates interview with at least one Entrepreneurial Scholars committee member and submit a letter of reference from an OWU faculty member. Learn more about Ohio Wesleyan’s Woltemade Center at www.owu.edu/woltemade and more about the university’s Department of Economics and Business at www.owu.edu/economics.